However cliched it may be, there is something heartwarming about the sheer enthusiasm and exuberance and sense of renewal that infects all of us at New Year. Like every single one of you, I imagine, my WhatsApps are full of good wishes and videos of champagne bottles popping open, and Instagram this morning has nothing but amazing images of fireworks ushering in 2018 from all corners of the globe. Yes, you’re right, it is possibly a tad sappy, but hey! it’s the first day of a brand new year and everyone is entitled to hope for better things, for change, for improvement. Including the Indian tax man. 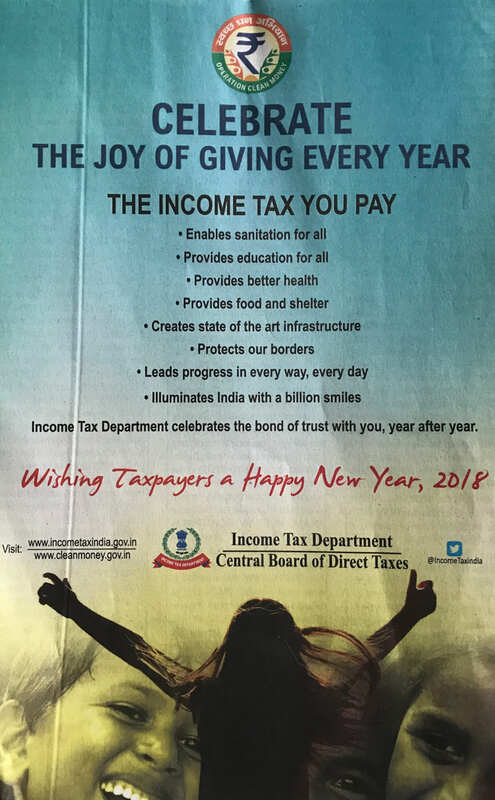 My just inaugurated 2018 Award For The Most Pointless Waste Of My Tax Rupees goes to…quick drumroll…this ad in my morning rag. On a morning when millions of people are waking up with a massive hangover 😛 and those of us here in Delhi can’t see beyond 2 metres, so thick is the fog, the tax man is celebrating the bond of trust with me. Celebrate the joy of giving, forsooth. This ad is a shoe-in for first prize for sheer pointlessness. No one, no one I repeat, will ever celebrate paying their taxes. ”Illuminates India with a billion smiles”. “state of the art infrastructure” indeed ! !